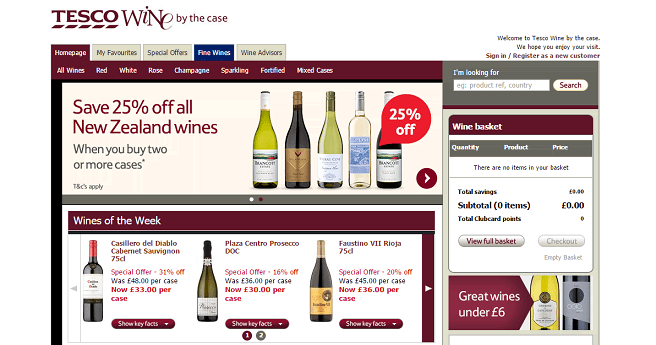 Tesco Wine By The Case cashback can be earned simply by clicking through to the merchant and shopping as normal. Tesco Wine By The Case Cashback is available through TopCashback on genuine, tracked transactions completed immediately and wholly online. Buy your favourite wine from around the world, including online exclusives, and benefit from great Tesco Wine deals. Whether your preference is red wine, white wine, rose, fortified or sparkling wine, you can order cases of six 75cl bottles or more and make great savings on vintage Champagne or prosecco, as well as mixed cases. Browse by country or grape variety and treat yourself to a wine case full of cabernet sauvignon, malbec, merlot, pinot grigio, sauvignon blanc or shiraz from France, Spain, Australia, Italy and the USA by brands like Jacob's Creek, Hardys, Yellow Tail and Robert Mondavi. Browse superb Tesco Wine offers, while they display the case and per bottle price so you can see how good of a deal you are getting. Not only will you earn Tesco Clubcard points when you buy, but if you sign up to TopCashback using the form below, you can save with our Tesco Wine discount code and cashback deals. If you are eager to use a Tesco Wine voucher but are struggling to find the perfect bottle, you can contact one of their dedicated team of wine advisors by email and they will be able to give you some advice. Each member is Wine and Spirit Education Trust (WSET) trained, meaning they are fully qualified to help you order one of their great wines. Whether you are purchasing for a special event or want to try something new at home and are in need of some advice, they can suggest the best possible wines for your needs. Let them help you select wine for your wedding, a corporate function or to give as a gift, while the service is completely free of charge. Once you have used our Tesco Wine vouchers to make your selection of French Champagnes or Italian and South African wines, they offer next day or time slot options. With next day delivery, order by 3pm (Sunday-Friday) and their courier will do their best to get your goods to you the next day, between 7am and 7pm. Saturday orders should be delivered the following Monday, while these times may vary on Bank Holidays. They are unable to give you an exact time for delivery and if you might not be in, you should provide details of a safe place to leave your wine when you checkout. With time slot delivery, you will be able to pick a time slot for your wine to be delivered via a Tesco delivery van. You can usually have your wine delivered between 8am and 11pm Monday-Friday, 8am and 10pm on Saturday and 10am and 10pm on Sunday. If you order 10 cases or more and agree with a member of the Wine Advisor team beforehand, you can benefit from their 'sale or return' policy which, for an extended period of three months after delivery, will allow you to return up to 10% of your order. If you do send items back, the wines must be returned in their original packaging, while the labels, foils and corks or screw-caps must be intact and unopened. You can only send back full, whole cases, while the 'sale or return' offer does not apply to fine wines. Returns which represent more than 10% of the total order will be rejected. You will be raising a toast to these top deals on wine which will earn you great cashback rewards. Find your favourite wines, browse special offers which could save you 50% and search for exclusive delicious wines from around the world which are not available in store with Tesco Wine By The Case. Buy red, white, rose and sparkling wine, champagne and fortified wine. Order a minimum of six bottles and choose next day delivery on orders placed by 3pm or a two-hour time slot delivery between 7am and 11pm - both free when you spend more than £75.